Synonyms and Other Names: Cichlasoma biocellatum Regan 1909, C. hedricki Meek 1904, C. octofasciatum (Regan 1903); mojarra castarrica, riquiraqui (Kullander 2003). Identification: In general, cichlids (Cichlidae) are superficially similar to North American native sunfishes and black basses (Lepomis and Micropterus; family Centrarchidae). Cichlids can be distinguished from centrarchids by a single nostril opening on each side of the head (vs. two in centrarchids) and the presence of a discontinuous or two-part lateral line (continuous in centrarchids). The species is included in identification keys of Greenfield and Thomerson (1997). For distinguishing characteristics and figure see Page and Burr (1991). Color photographs appeared in Konings (1989) and in Conkel (1993). Schmitter-Soto (2007), in a revision of the genus Archocentrus, erected the genus Rocio for this and two newly described species, and provided a key to related genera. Native Range: Tropical America. Atlantic Slope drainages in Middle America from Río Paso San Juan, Veracruz, Mexico, south to the Río Ulua basin in Honduras (Greenfield and Thomerson 1997). Table 1. States with nonindigenous occurrences, the earliest and latest observations in each state, and the tally and names of HUCs with observations†. Names and dates are hyperlinked to their relevant specimen records. The list of references for all nonindigenous occurrences of Rocio octofasciata are found here. Means of Introduction: Likely aquarium release in most cases, with the possibility of aquaculture escape in areas of Florida adjacent to current or former aquaculture production facilities. Status: Locally established in South Dakota; established in Hawaii. In Florida, extirpated in Alachua County; unknown in other counties. Failed in California, Colorado, and Connecticut. Impact of Introduction: The omnivorous, opportunistic feeding behavior of the Jack Dempsey should enhance its survival in areas where it is introduced (Jennings 1986). Remarks: Juvenile fish from the vicinities of Gibsonton, Riverview, and Ruskin in Hillsborough County, identified as Cichlasoma cyanoguttatum by Buntz and Chapman (1970), were actually this species (Courtenay et al. 1974). This highly aggressive and combative species possibly competes with native sunfishes for food and spawning sites. 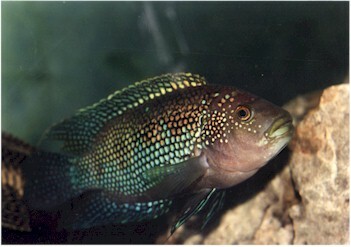 A report of convict cichlid (Archocentrus nigrofasciatus) near Hume Pond on the University of Florida campus in 2002 may have been this species (L. Somma, personal communication). Based on its abundance ans success in seasonal karst wetlands in Yucatan and Belize (Zambrano et al. 2006), it may be preadapted to Everglades ecosystem wetlands if ever introduced there. Shafland et al. (2008) lists this species as 'formerly reproducing' in Florida due to the intermittent nature of collections. Rocio octofasciata is also introduced in Australia (Welcomme 1988), Russia (Zworykin and Pashkov 2010), and Thailand (Nico et al. 2007). Museum records – California (LACM 44336.001); Florida (UF 29846-7, 91878, 100550, and many others; UMMZ 200778). Cordone, A.J. - Department of Fish and Game, Sacramento, CA. Response to NBS-G non-indigenous questionnaire. 1992. Devick, W.S. 1991. Disturbance and fluctuations in theWahiawa Reservoir ecosustem. Project number F-14-R-15, Job 4 Study I. Division of Aquatic Resources, Hawaii Department of Land and Natural Resources. Dial, R.S., and S.C. Wainright. 1983. New distributional records for non-native fishes in Florida. Florida Scientist 46(1):8-15. Gilmore, R.G., P.A. Hastings, and D.J. Herrema. 1983. Ichthyofaunal additions to the Indian River Lagoon and adjacent waters east-central Florida. Florida Scientist 46:22-30. Jennings, D.P. 1986. Characterization of a localized Jack Dempsey, Cichlasoma octofasciatum, population in Alachua County, Florida. Florida Scientist 49(4):255-259. Levine, D.S., J.T. Krummrich, and P.L. Shafland. 1979. Renovation of a borrow pit in Levy County, Florida, containing Jack Dempseys (Cichlasoma octofasciatum). Non-native Fish Research Laboratory, Florida Game and Fresh Water Fish Commission, Boca Raton, FL. Contribution 21. Minerich, S. 2009. Personal communication. South Dakota DENR. Schmitter-Soto, J.J. 2007. A systematic revision of the genus Archocentrus (Perciformes: Cichlidae), with the description of two new genera and six new species. Zootaxa 1603:1-78. Schofield, P.J. 2013. Personal communication. USGS, SESC, Gainesville, FL. Walker, P.G. 2010. Personal communication. Colorado DNR-Division of Wildlife, Aquatic Health Program. Brush, CO.
Welcomme, R.L. 1988. International introductions of inland aquatic species. FAO Fisheries Technical Paper 294. Food and Agriculture Organization of the United Nations (FAO), Rome, Italy. http://www.fao.org/docrep/X5628E/X5628E00.htm. Zambrano, L., E. Vazquez-Dominguez, D. Garcia-Bedova, W.F. Loftus, and J.C. Trexler. 2006. Fish community structure in freshwater karstic wetlands of the Yucatan Peninsula, Mexico. Ichthyological Explorations of Freshwater 17:193-206. Zworykin, D.D., and A.N. Pashkov. 2010. Eight-striped Cichlasoma—an allochthonous species of cichlid fish (Teleostei: Cichlidae) from Staraya Kuban Lake. Russian Journal of Biological Invasions 1(1):1-6.